"Cool and easy recipe. Everyone always loves it, especially my niece." In a punch bowl, mix together fruit punch, pineapple juice and ginger ale. Add scoops of sherbet into the punch. Wait for the sherbet to begin melting, approximately 10 minutes, stir gently, and serve. A refreshing, delicious fruit punch with ginger ale and orange sherbet. I used Fresh Pineapple Chunks instead of Pineapple juice... and left out the sherbet. It was soooo yummy! I also added fresh cut up strawberries too. Will definitely make again! while this recipe tasted delicious, it didn't look appetizing in the punch bowl & only got worse as the night went on. I would advise buying the brightest red fruit punch you can find. I used this for a birthday party and it was a huge hit! A wonderful punch. Super easy and super perfect! Easy to transport to a party, just leave everything in it's packaging and prepare where ever you go! Thank you! 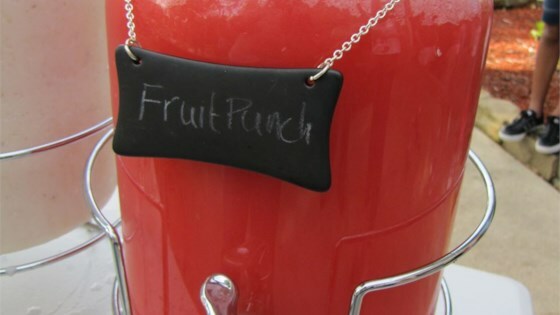 A good classic party punch recipe that kids will love. The adults added champaign when I served it Christmas Eve. It was good that way too. Everyone loved this, it was a huge hit at the baby shower. Got many requests for a copy of the recipe.